Background: Preventable thyroid dysfunction has remained a neglected entity worldwide. Excess fluoride consumption over years leads to irreversible thyroid dysfunction. Materials and Methods: Subjects (N = 275) with thyroid dysfunction were recruited from medicine and endocrinology OPDs/wards and were thoroughly examined. The source and type of water consumed by these subjects was asked and sampled for fluoride analysis. 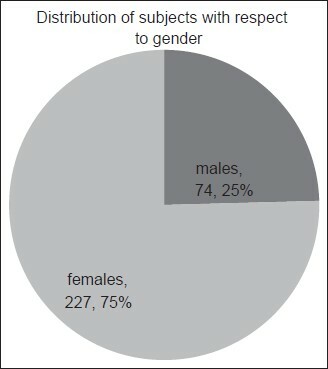 Results: A majority (75%) of the subjects were females. Hypothyroidism including subclinical hypothyroidism was the major underlying dysfunction. Majority of the afflicted (53%) consumed ground water as their predominant drinking water source. Fluoride content was well above acceptable limits of potability (1mg/L) in ground water and this correlated positively with elevated serum thyroid stimulating hormone (TSH) and negatively with free T3 levels in blood. The correlation was statistically significant (P < 0.05). Conclusion: Excess of fluoride in drinking water was the plausible cause of hypothyroidism in study individuals. Fluoridation of water for prevention of dental caries is a policy that can be amended for the sake of this larger picture. Thyroid diseases deserve recognition as non-communicable diseases (NCDs) of public health importance. Lately, voices have been raised on international fora regarding recognition and inclusion of thyroid disorders among non-communicable diseases (NCDs) of public health importance. Besides, it has been appreciated that a large proportion of thyroid disorders can be attributed to certain environmental agents (inorganic compounds of fluoride) present in drinking water. It has been demonstrated that in humans, effects on thyroid function were associated with fluoride exposures of 0.05-0.13 mg/kg/day when iodine intake was adequate and 0.01-0.03 mg/kg/day when iodine intake was inadequate. , Very few studies have been conducted in India, which correlate thyroid disorder with the types of drinking water and its fluoride content. This makes a strong case for exploring a possible association between the two, particularly in district Agra, where a major chunk of drinking water is being met by ground water. To analyze correlation, if any, between thyroid dysfunction and sources of drinking water consumed with special reference to its fluoride content. Agra is the most populous district in Uttar Pradesh with an estimated population of 4380793 (Census, 2011). In terms of urbanization level, Agra district ranks 8 th among all districts of Uttar Pradesh. Agra city is surrounded by many leather tanneries and small-scale dying industries and their effluents are discharged in to the Yamuna River causing impact on the quality of the underground water. Solid waste from industries is being dumped near the factories and subjected to reaction with percolating rainwater and reaches the ground water level. The percolating water picks up a large amount of dissolved constituents and reaches the aquifer system and thus it contaminates the ground water. Local residents through bore-wells and hand pumps currently augment water supply with groundwater. The groundwater quality has indicated higher concentration of electrical conductivity, total dissolved solids, hardness, calcium, magnesium, chloride, sulphate, nitrate, fluoride, iron, manganese, nickel, lead and cadmium vis-ΰ-vis drinking water quality standards. Among these all, fluoride is the candidate culprit chosen for this study on account of its well-known cumulative effects on the thyroid gland, in particular. Besides groundwater, other sources of drinking water supply in the region were those from the Municipal Corporation and individually installed Reverse Osmosis (RO) systems. The drinking quality of these is also a subject of analysis in this study vis-ΰ-vis fluoride content. Hospital based cross-sectional descriptive study. Endocrinology OPD and Medicine Ward and OPD of SN Medical College, Agra. Individuals from all age groups. Purposive sampling. (N = 275). All subjects with known or newly diagnosed thyroid disease. Those individuals who refused to participate in the study. Individuals with a pre-existent/concurrent severe comorbid illness were also excluded. Consecutive patients of thyroid disease (recognized or newly diagnosed) coming to the OPD (medicine and endocrinology) during the study duration were recruited for the study. The presence of thyroid disease was confirmed by laboratory measures. The outcome measures were serum TSH and free T3 and T4 levels. Cases of thyroid disease (previously recognized and new) were then interviewed based on a pre-structured pre-tested questionnaire. The initial interview (first part of the questionnaire) contained questions about demographics, anthropometry, reproductive history, hormone use, family history of thyroid disease, residence location, physical activity, smoking, alcohol consumption, and comorbid medical conditions so as to elicit a possible known medical/surgical cause of the dysthyroid state. This also included questions on whether the respondent had ever taken medication for hypothyroidism and hyperthyroidism, and whether they were currently taking medication for these conditions. Relavant clinical examination of all cases was done and findings recorded. An exhaustive search for an already existing etiology of the dysthyroid state in the study patients was required in order to avoid confounding in results later on. Information about the participants' usual source of drinking water was collected in the second part of the questionnaire. Participants were asked about the primary source of their drinking water at their current residence (municipal [public] water supply, ground water, private well, bottled water, RO treated, or others) and for how long they had been consuming that type of water (<1 year, 1-5 years, 6-10 years, 11-20 years, >20 years, or unknown). Tests to detect presence of fluoride were performed upon their water samples as per the World Health Organization (WHO) recommendations. Drinking water from each source such as bottled/selected households reverse osmosis (RO), tap Municipal Corporation of Delhi (MCD), hand pump (ground), were collected in clean and dry 60 ml polypropylene containers. Each sample was labeled giving the time, date, site and source. When collecting tap water, the tap was allowed to run for a few minutes to collect an evenly distributed sample of water. After collection, the samples were stored in a refrigerator. The F - concentration was analyzed two weeks later by using an ion-specific electrode and difference electrode, Fluoride Electrode Instrument (Orion). After 3 minutes, the F - concentration in the water sample was read directly from the digital display meter. For each sample, two fluoride readings were taken. Only the first reading was included in the study. Quantitative data were expressed as mean ± standard deviations (S. D). Association between variables was assessed by Pearson's bivariate cofficient of correlation. Two-sided 'P' < 0.05 were considered statistically significant. The statistical software used was Statistical Package for the Social Sciences software (SPSS for windows, version 21.0 Chicago, Illinois, USA). 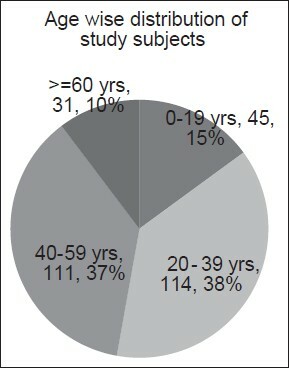 [Figure 1] and [Figure 2] depict that as many as two third of the subjects were females (75%). Majority of the cases (among both sexes) were in the age group of 20-39 years (37.7%), that is to say, the economically productive age group. [Table 1] depicts the profile of thyroid dysfunction profile in relation to the source of drinking water. Out of the 110 cases of subclinical hypothyroidism detected in the study, maximum number of cases (37.2%), were consuming ground water for drinking. Similarly, of the 161 cases proven with overt hypothyroidism, maximum (58.3%) were using ground water again as their predominant drinking water source. [Table 2] depicts the mean and standard deviation values of selected variables (Age, Fluoride levels in water, Serum TSH and Ft3 levels) in relation to the source of drinking water. The mean age in group A was 39.28 (±16.38) years, in group B it was 33.09 (±11.82) years, in group C it was 41.06 (±16.38) years. Maximum mean fluoride levels, 2.50 (±1.27) mg/dl were observed in Group A, followed by 0.82 (±0.07) mg/dl in Group B and 0.76 (±0.11) mg/dl in Group C.
Similarly, maximum mean TSH levels were recorded in Group A, 9.66 (±4.02) miU/L followed by Group B, 7.48 (±3.21) miU/L and Group C, 8.38 (±4.28) miU/L. The lowest mean fT3 levels were observed in Group A, 3.76(±1.41) pmol/l, followed by those in Group B, 4.13(±2.13) pmol/l and in Group C, 4.02 (±2.30) pmol/l. [Table 3] depicts the correlation between water fluoride and serum TSH in different study groups. A statistically significant (P < 0.01) positive relationship was observed between the concentration of fluoride in Group A drinking water and serum TSH [r = 0.53, Figure 3.1]. In Group B, A positive association (r = 0.01) was observed between the two variables but was not statistically significant (P > 0.05), [Figure 3].2. A negative correlation was observed between concentration of fluoride in drinking water in Group C subjects, but was however not statistically significant (P > 0.05), [Figure 3].3. (r = −0.06 and r = −0.01, respectively) but was statistically significant in group A (P < 0.05) only. [Figure 4].1 and 4.2]. A positive correlation was observed between concentration of fluoride in drinking water of Group C and serum fT3 (r = 0.02 and r = 0.14), but was not statistically significant (P > 0.05); [Figure 4].3.
subclinical hypothyroidism in eastern Nepal, which in a hospital based study and observed its prevalence amongst suspected cases to be of the order of 20.42%. The results are consistent with our study. Usha Menon et al., (2009)  have, however, demonstrated a far lower prevalence of subclinical hypothyroidism (9.4%) in their study. However, theirs was a large-scale population based study with several variables; and therefore, scientifically not comparable with a hospital based study like ours. Hyperthyroidism was a rarer entity among our subjects. Subclinical hyperthyroidism was present in 6.6% cases and overt hyperthyroidism was present in 3.4% cases. In a study by N. K. Yadav et al., (2012)  subclinical and overt hyperthyroidism were present in 7.9% and 1%, respectively. The results are consistent with our study. In a hospital based study by Abraham R et al., (2009)  in Puducherry, subclinical and overt hyperthyroidism were present in 0.6% and 1.2% of subjects. The slight variation could be explained by the inclusion of cases mostly from the thyroid clinic in our study, leading to the increased percentage of hyperthyroid cases. 47 healthy persons, 43 persons with hyperthyroidism, and 33 persons with hypothyroidism. Prolonged consumption of "high-fluoride" drinking water (2.3 mg/L, as opposed to "normal" concentrations of 1 mg/L) by healthy persons was associated with statistically significant changes in TSH concentrations (increased), T3 concentrations (decreased), and uptake of radioiodine (increased). These results were interpreted as indicating disruption of iodine metabolism, stress in the pituitary-thyroid system, and increased risk of developing thyroidopathy (Bachinskii et al.,  1985). Lin et al.,  (1991) examined 769 children (7-14-years old) for mental retardation in three areas of China, including an area with "high" fluoride (0.88 mg/L) and low iodine, an area with "normal" fluoride (0.34 mg/L) and low iodine, and an area where iodine supplementation was routine (fluoride concentration not stated). Ten to twelve children in each area received detailed examinations, including measuring thyroid 131 Iodine uptake and thyroid hormone concentrations. Children in the first area had higher TSH, slightly higher 131 Iodine uptake, and lower mean IQ compared with children in the second area. Children in the first area also had reduced T3 and elevated reverse T3, compared with children in the second area. The authors suggested that high fluoride might exacerbate the effects of iodine deficiency. In addition, the authors reported a difference in T3/rT3 (T3/reverse-T3) ratios between high- and low-fluoride areas and suggested that excess fluoride ion affects normal de-iodination. Mikhailets et al.,  (1996) detected thyroid abnormalities (moderate reduction of iodine uptake, low T3, normal T4, and increased TSH) in 165 aluminum workers with signs of chronic fluorosis and an estimated average fluoride intake of 10 mg/working day. A recent study by Susheela et al.,  (2005) compared thyroid hormone status (free T4, free T3, and TSH) of 90 children with enamel fluorosis (drinking water fluoride ranging from 1.1 to 14.3 mg/L) and 21 children without enamel fluorosis (0.14-0.81 mg/L fluoride in drinking water) in areas where iodine supplementation was considered adequate. Forty-nine children (54.4%) in the sample group had "well-defined hormonal derangements"; findings were borderline in the remaining 41 children. The authors concluded that fluoride in excess may be inducing diseases that have usually been attributed to iodine deficiency and that iodine supplementation may not be adequate when excess fluoride is being consumed. The purpose of this study is to sensitize the world health 'stakeholders' and general public alike of the very existence and nuisance of environmental thyroid disorders (ETDs), in certain geographical areas like the semi-arid plains of Agra district in India. Concomitantly, the authors would like to make a case for recognition and inclusion of thyroid disorders as one among the constellation of the NCDs, a major portion of which is amenable to primary prevention. Excess of fluoride in drinking water, particularly ground water has been shown to demonstrate a linear correlation with raised TSH levels, most of which are subclinical thus forming the proverbial' tip of the iceberg'. Also, fluorosis is known to compound its detrimental effects in areas already deficient in their iodine status. The cumulative toxicity of fluoride only adds to the woes of the afflicted population over the years. The authors request to utilize this podium to raise a voice in support of curbing fluoridation of water in an attempt to prevent dental fluorosis, under the National Fluorosis Control Program. The WHO also treats fluoride more like a drug than an essential nutrient. Last but not the least, the National Iodine Deficiency Control Program and the National Fluorosis Control Program have to work in tandem with effective inter-sectoral coordination and periodic evaluation in order to achieve 'potability' of water, a most basic human right indeed. Unnikrishnan AG, Menon UV. Thyroid disorders in India: An epidemiological perspective. Indian J Endocrinol Metab 2011;15:S78-8l. Usha Menon V, Sundaram KR, Unnikrishnan AG, Jayakumar RV, Nair V, Kumar H. High prevalence of undetected thyroid disorders in an iodine sufficient adult south Indian population. J Indian Med Assoc 2009;107:72-7. Shah SN, Joshi SR. Thyroid as an endocrine organ. J Assoc Physicians India 2000;48:7-8. Fluoride in drinking water: A scientific review of EPA's standards book. Academic Publishers: The National Academic Press; 2006. p. 263. Fluorides and oral health. Report of a WHO expert committee on oral health status and fluoride use. World Health Organ Tech Rep Ser 1994;846:1-37. Yadav NK, Thanpari C, Shrewastwa MK, Sathian B, Mittal RK. Socio demographic wise risk assessment of thyroid function abnormalitiesin far western region of Nepal: A hospital based descriptive study. Asian Pac J Trop Dis 2013;3:150-154. Mahato RV, Nepal AK, Gelal B, Poudel B, Yadav BK, Lamsal M. Spectrum of thyroid dysfunction in patients visiting Kantipur Hospital, Kathmandu, Nepal. Mymensingh Med J 2013;22:164-9. Rohil V, Mishra AK, Shrewastwa MK, Mehta KD, Lamsal M, Baral N, et al. Subclinical hypothyroidism in eastern Nepal: A hospital based study. Kathmandu Univ Med J (KUMJ) 2010;8:231-7. Abraham R, Srinivasa Murugan V, Pukazhvanthen P, Sen SK. Thyroid disorders in women of Puducherry. Indian J Clin Biochem 2009;24:52-9. Shashi A, Singla S. Syndrome of low triiodothyronine in chronic fluorosis. International Journal of Basic and Applied Medical Sciences ISSN: 2277-2103 (Online) [Last accessed on 2013 Dec 18]. Susheela AK, Bhatnagar M, Vig K, Mondal NK. Excess fluoride ingestion and thyroid hormone derangements in children living in Delhi, India. Fluoride 2005;38:98-108. Wilson D. Fluorine in the aetiology of endemic goitre. Lancet 1941;15:212-3. Siddiqui AH. Fluorosis in Nalgonda District, Hyderabad-Deccan. Br Med J 1955;2:1408-13. 14 Desai MP. Disorders of the thyroid gland in India. Indian J Pediatr 1997;64:11-20. Day TK, Powell-Jackson PR. Fluoride, water hardness, and endemic goitre. Lancet 1972;1:1135-8. Murray MM, Ryle JA, Simpson BW, Wilson DC. Thyroid enlargement and other changes related to the mineral content of drinking water with a note on goitre prophylaxis. Brit Med Res Counc Memo1948; :6:18. SteynDG, Reinach N. Endemic Goitre in the Union of South Africa and Some Neighbouring Territories. Union of South Africa. Depart Nutr 1955:7:18-24. Jooste PL, Weight MJ, Kriek JA, Louw AJ. Endemic goitre in the absence of iodine deficiency in schoolchildren of the Northern Cape Province of South Africa. Eur J Clin Nutr 1999;53:8-12. Obel AO. Goitre and fluorosis in Kenya. East Afr Med J 1982;59:363-5. Bachinskii PP, Gutsalenko OA, Naryzhniuk ND, Sidora VD, Shliakhta AI, et al. Action of the body fluorine of healthy persons and thyroidopathy patients on the function of hypophyseal-thyroid the system. Probl Endokrinol (Mosk) 1985;31:25-9. LinFF, Aihaiti, Zhao HX.The relationship of a low-iodine and high-fluoride environment to subclinical cretinism in Xinjiang. Iodine Deficiency Disorder Newsletter 1991;7. Mikhailets ND, Thyroid function during prolonged exposure to fluorides. Probl Endokrinol 1996;42:6-9.